The first Italian States stamps for the Kingdom of the Two Sicilies were issued in 1858. The Kingdom of the Two Sicilies was formed in 1815, in the aftermath of the fall of Napoleon Bonaparte and his French Empire, by the union of the Kingdom of Sicily with the Kingdom of Naples (once known as the Kingdom of Peninsular Sicily). The two kingdoms had often been referred to collectively as the "Two Sicilies". The new kingdom spanned all of Southern Italy and the island of Sicily, with its dual capitals at Naples and at Palermo. At the time, the Kingdom of the Two Sicilies was the largest of the Italian States. 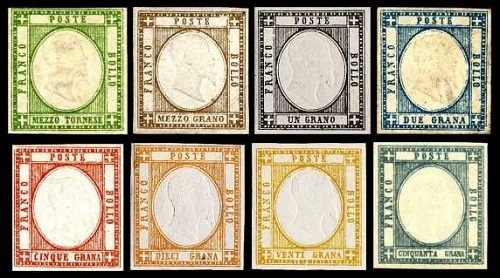 The seven definitive Italian States stamps for Naples shown above were issued on January 1, 1858. They are engraved on paper with forty Fleur-de-Lis designs in the pane (only a portion will show on each stamp), and they are imperforate. The common design of these stamps features heraldic symbols of the Kingdom of the Two Sicilies. 1/2 G. (1858 - Sc. #1) - Pale Rose, Rose Lake, Lake, Carmine Lake. 01 G. (1858 - Sc. #2) - Pale Lake, Rose Lake, Brown Lake, Carmine Lake. 02 G. (1858 - Sc. #3) - Pale Lake, Rose Lake, Carmine Lake. 05 G. (1858 - Sc. #4) - Brown Lake, Rose Lake, Carmine Lake, Rose Carmine, Bright Carmine, Dark Carmine. 10 G. (1858 - Sc. #5) - Rose Lake, Lake, Carmine Lake. 20 G. (1858 - Sc. #6) - Rose Lake, Lake, Pale Rose, Pale Carmine Rose. 50 G. (1858 - Sc. #7) - Rose Lake, Lake. There are many forgeries of these Italian States stamps for Naples. Comparison with authenticated originals is necessary. However, there is a great tool in identifying many of the "original" stamps, which will work on most well-struck examples. 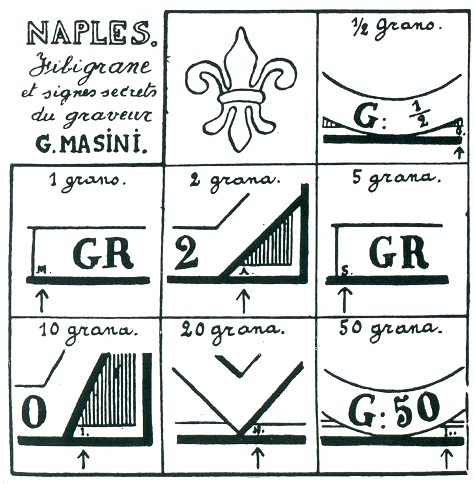 The engraver, "G. Masini" integrated microscopic letters or "secret marks" from his name into each of the stamp designs. The image shown above, from the Serrane Guide, shows the location and appearance of each of these "secret marks". The two Italian States stamps for Naples shown above were issued in November and December of 1860 by the provisional government of General Giuseppe Garibaldi. The first design features heraldic symbols of the Kingdom of the Two Sicilies. The second design features the Cross of Savoy, the heraldic symbol of the Kingdom of Sardinia. The second design was created by erasing the Two Sicilies symbols from the plate and then inserting the Cross of Savoy in its place. All original stamps will show traces of the original design. Stamps that do not show any traces are definitely forgeries. 1/2 T. (1860 - Sc. #8) - Deep Blue. 1/2 T. (1860 - Sc. #9) - Blue, Deep Blue. Dangerous forgeries exist for both of these stamps. However, considering that the 2016 Scott Classic Specialized Catalogue value for mint condition examples of these stamps is $330,000.00, it is very unlikely that anyone would ever buy either of these two stamps without extensive certification. It would probably be safe to assume that any unauthenticated examples of these stamps found in the philatelic marketplace or in collections may very likely be forgeries. 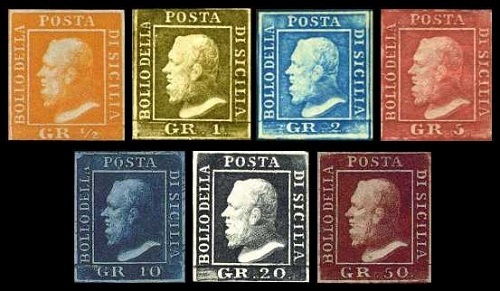 The seven major-type definitive Italian States stamps for Sicily shown above were issued on January 1, 1859. They are engraved on unwatermarked paper, and they are imperforate. The common design of these stamps features the left-facing profile of King Ferdinand II. There were two so-called consignments of these stamps. The Naples Consignment (all denominations) was printed on soft porous paper with brownish gum. The Palermo Consignment (1/2 G. - 2 G. denominations) was printed on hard white paper with white gum. These stamps were also printed from different plates, each of which has its own specific design characteristics. For detailed information on the classification of the stamps from each of the different plates, please refer to the Scott Classic Specialized Catalogue or any of the other specialized catalogs for the Kingdom of the Two Sicilies. The Serrane Guide features multiple pages describing the reconstruction of all the plates of these stamps. When Serrane published his book in 1928, these stamps must have been a whole lot less expensive than they are now. At the prices of these stamps today, attempting the reconstruction of all these plates would probably be a futile and prohibitively expensive effort, when just obtaining a single example of each denomination would require an expenditure of several thousand dollars! The very simplified Scott catalog attributes are as follows. 1/2 G. (1859 - Sc. #10) - Orange, Yellow, Olive Yellow, Brownish Yellow, Deep Orange, Reddish Orange, Bright Yellow. 01 G. (1859 - Sc. #11) - Dark Brown, Olive Brown. 01 G. (1859 - Sc. #12) - Olive Green, Grayish Olive Green, Pale Olive Green. 02 G. (1859 - Sc. #13) - Blue, Deep Blue, Pale Blue, Greenish Blue, Ultramarine, Cobalt, Dark Cobalt. 05 G. (1859 - Sc. #14) - Deep Rose, Carmine, Brick Red, Dark Carmine, Blood Red. 05 G. (1859 - Sc. #15) - Vermilion, Orange Vermilion, Bright Vermilion. 10 G. (1859 - Sc. #16) - Dark Blue, Indigo, Indigo Black. 20 G. (1859 - Sc. #17) - Dark Gray Violet, Slate Black, Slate Violet. 50 G. (1859 - Sc. #18) - Dark Brown Red, Dark Purple Lake. 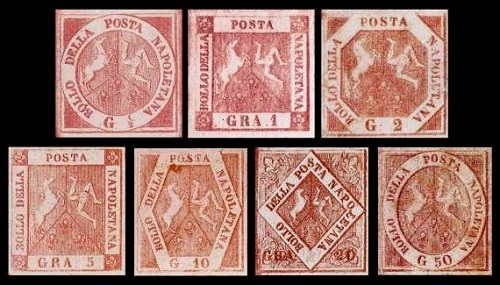 The eight major-type definitive Italian States stamps for the Neapolitan Provinces shown above were issued on February 14, 1861. These stamps are lithographed with the frame in color and a colorless embossed vignette, and they are imperforate. The common design features the embossed right-facing portrait of King Victor Emmanuel II of Sardinia. 1/2 T. (1861 - Sc. #19) - Green, Yellow Green, Emerald, Olive Green. 1/2 G. (1861 - Sc. #20) - Bister, Brown, Gray Brown. 01 G. (1861 - Sc. #21) - Black, Silver Gray. 02 G. (1861 - Sc. #22) - Blue, Deep Blue, Sky Blue, Slate Blue, Indigo. 05 G. (1861 - Sc. #23) - Carmine Rose, Vermilion, Lilac Rose, Lilac, Dark Lilac. 10 G. (1861 - Sc. #25) - Orange, Ocher, Bister, Olive Bister. 20 G. (1861 - Sc. #26) - Yellow, Orange Yellow. 50 G. (1861 - Sc. #27) - Gray, Slate, Slate Blue, Blackish Gray. Be careful! Forgeries of the inverted and doubled head varieties have been made by applying fake embossing to printer's waste without the embossed heads. Such stamps are worthless! Forgeries and unofficial reprints of these stamps also exist. In 1862, the Italian States stamps for the Kingdom of the Two Sicilies were replaced by those of the Kingdom of Italy. The last two monarchs of the Kingdom of the Two Sicilies are shown above. Ferdinand II, in the early years of his reign was a kind monarch, and he was well liked by his people, but that would soon change. In 1837, he violently suppressed demonstrations demanding a new constitution, and he established strict police surveillance in all the regions of the kingdom. The Revolution of 1848, in the Kingdom of the Two Sicilies, was ultimately successful, and the King was eventually forced to grant a constitution based on the French model. In 1849, due to political disagreements, the king dissolved the parliament and became an absolute monarch. A soldier attempted to assassinate the king in 1856, but he survived the bayonet wound. The king finally died on May 22, 1859, shortly after Sardinia and France declared war on the Austrian Empire, beginning what would become the Second Italian War of Independence. Francis II ascended to the throne, the day his father died. 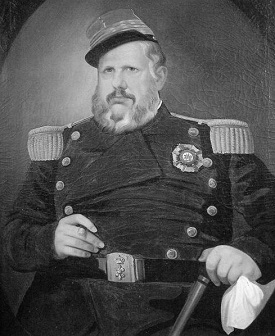 Unfortunately for the new king, his father's policies had triggered the political and social movement for Italian Unification (the Risorgimento) in the Kingdom of the Two Sicilies. His ministers urged him to form an alliance with the Kingdom of Sardinia, during the Sardinian conquest of the Papal States, but the king refused to take their advice. Giuseppe Garibaldi, quickly conquered Sicily in May 1860, then he proceeded through the Southern Italian Peninsula. On September 7, 1860, Garibaldi captured Naples and established a provisional government. He was widely acclaimed as the liberator by the entire population. In November 1860, the Sardinian army laid siege to Gaeta, where the royal family had fled. On February 13, 1861, the city surrendered, and the royal family fled the country. 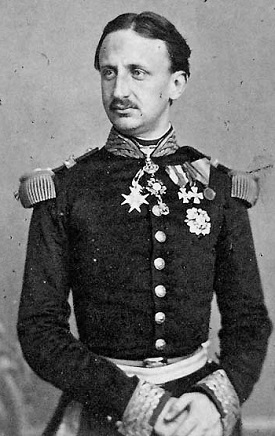 King Francis II spent the rest of his life in exile. The annexation of the Kingdom of the Two Sicilies by the Kingdom of Sardinia completed the struggle for Italian Unification (with the exception of Latium). The new Kingdom of Italy was officially proclaimed on March 17, 1861. The Sardinian king, Victor Emmanuel II of the House of Savoy, was proclaimed King Victor Emmanuel I of Italy.